Rounds 5 and 6 in the 4NCL were played this weekend, with Divisions 1 and 2 at their new venue at the Holiday Inn, Birmingham Airport, whilst Division 3 continued at Daventry Court Hotel. There were 21 members of Suffolk clubs playing. In Division 1, Alan Merry lost to GM Jonathan Speelman on Saturday, but drew with IM Adam Hunt today. Adam had beaten GM Peter Wells on Saturday. Justin Tan, still only 17, drew on Saturday against a 2404 and beat a 2312 today. If my calculations are correct, he will have achieved a live rating in excess of 2400. He should gain 25 points today, bringing his rating up to 2408. In Division 2, Anglian Avengers 1 won 4½-3½ on Saturday, but could only draw 4-4 today. They are now in mid-table in their group, having won two, drawn one and lost three matches to date. In Division 3, Anglian Avengers 2 won 3½-2½ on Saturday, with some excellent individual results, despite being heavily outgraded by their opponents. But they came unstuck today, losing 1-5, with only captain and Board 1 Ian Wallis managing a win (against an FM). The remaining results were losses for Iceni 1 today, by 2½-3½ and for Iceni 2 yesterday, by the same margin. Two Suffolk players won both their games - Steve Gregory and Bob Jones - whilst those on 1½ points included Adam Hunt, Justin Tan, Ian Wallis, Nick Savage and John Peters. Malcolm Lightfoot was also unbeaten. The photo above shows the unheralded heroes of the 4NCL - the arbiters and their helpers. They are the first there on Saturday morning, setting up the Hall, and the last to leave. 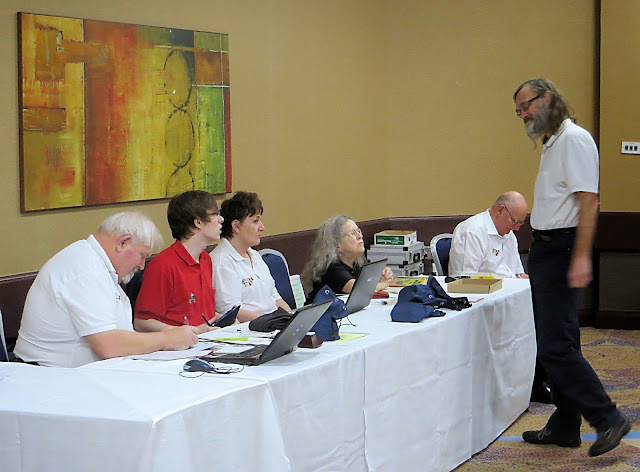 Chris Davison (Iceni 1) was the last to finish this evening, after six hours and five minutes of chess. The arbiters then had to put away all the sets, boards and clocks. They deserve a big thank you from all the players. Anglian Avengers 1 may be mid table but they can't have won three and lost three as they drew today! They have actually won two, drew one and lost three. Sloppy journalism? ... or a cunning ploy to see who is reading?! Oh, definitely the latter. Thank you Ian, now corrected.